Jadielady: Sedalia Fiber Arts Festival! This wonderful Photographer took some wonderful photos. My mom did too, but was on a disposable camera. Hoping to get copies of those at some point :) In the meantime I've taken some from Cyndi. We got there about 10:30, and started our initial lap of the pavillion. The first booth we saw, had some beautiful boucle, with a lovely sweater knit up in it. Mom was very tempted, but ultimately it would be a very expensive project. On the far side of the Pavillion, they had some sheep in a little pen. However, we could hear more bleating from the far side of a trailer, so we checked it out. There were 3 little baby lambs. 2 of them were just one day old, and one was 2 days old. They were so cute! There were more younguns in the trailer. The woman was in the middle of feeding them all, and I helped! It was so much fun! All the lambs that hadn't been fed yet were pushing at the ones that were eating, and trying to suckle my hand. Dad helped shepherd the little ones outside, because the dog was getting preocupied getting some attention :) They kept wanting to wander off, but he would walk them back towards the trailer. There were 2 vendors that didn't have any yarn. One lady had jewelry made from antlers, bones, and porcupine quills! Another lady had wonderful pottery. Mom bought my sister a small clay amulet which came with a nice leather cord. The Ravelry/Blogger people convinced me that despite my ADD tendancies and fears of patterns, that I should try to knit socks. So, mom bought me some sock yarn. What kind? Only the best for my first attempt: Socks that Rock in pink Granite. 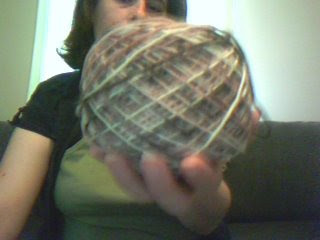 I bought myself a ball winder, so here's my yarn all wound up nice and neat! 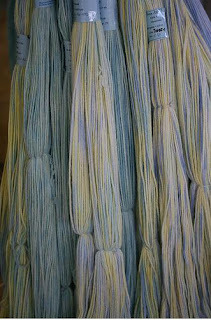 Mom bought herself some hand dyed alpaca yarn from a very nice woman who was near the center of the pavilion. I think she's going to knit herself a sweater! All in all it was a wonderful time. Once we were worn out, we refueled on a Funnel Cake, and then headed to our family cabin on the James River for some relaxation. I hope everyone has a wonderful and safe Memorial day weekend. Fun times! It's amazing how many animals we knit off of these days.. I'm so glad you and your family had a good time at the festival. Dianne and I had a chance to hold the lambs Friday night and my daughter and I helped to give them their breakfast bottles Saturday morning. That was a real treat! I petted and coveted Kid Hollow's boucle too. I've never worked with it, but it was beautiful and I'll have to give it a try sometime in the near future. Thanks so much for coming! P.S. The new do picture is excellent! I would have been hypnotized by the funnelcakes. It was wonderful to see you after all this time..and your blog post is such a positive with awesome photos..Thank you! A great choice for first sock yarn..STR..and your visit with the 'babies'..stir my heart after the warm encounter Dana and I had on Fri. Thank you and your family for coming and being such wonderful supporters..We look so forward to another year and offering more. Sounds like you had fun. Love your sock yarn! That baby sheep is CUTE!